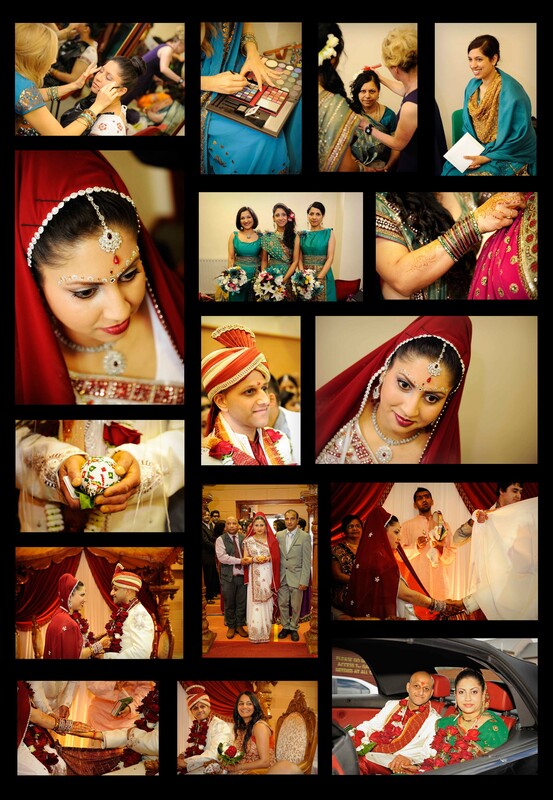 I was delighted to be the wedding photographer for Trish and Chatan who tied the knot on June 24th 2012. The wedding celebrations took place at Shree Ram Mandir, Walsall. Shree Ram Mandir is a Hindu temple and community centre serving the Hindu community of Walsall and the surrounding area. Due to its size, it is a perfect venue for an Indian wedding. The staff were very helpful, they decorated the place beautifully and served a fantastic wedding breakfast. The day started with Trishna’s bridal preparations in a private room at the venue. I was there to capture the girls getting ready, perfecting hair and make up and having a good time. The atmosphere was incredible with lots of singing, dancing and well wishing! Trishna looked beautiful, check out the bridal portraits with her lovely eyes and gorgeous jewellery! I loved the bright colours of the flowers and ladies’ clothing – they really add to the vibrance of the wedding photographs! The excitement was raised another level with the anticipation of the groom’s arrival. Several hundred people gathered at the door of the temple singing and chanting. Chatan looked fabulous as he arrived in a stylish convertible looking like a king! He was then led to the front of the room to sit on a specially decorated stage (known as the ‘mandap’), eagerly awaiting his bride. A sheet, held by two gentlemen from each side of the family, prevented Chatan from seeing the bride. Trish looked stunning as she entered the room. The moment the sheet was dropped to reveal the bride to the groom was wonderful. They looked incredibly happy! The traditional Hindu rituals continued over the next few hours. The bride and groom’s foreheads were marked with red powder (or ‘kum kum’) which marks the beginning of the relationship between the two families. Trishna and Chatan then exchanged garlands (known as ‘jayamaala’). Several gifts were exchanged throughout the day, this part of the ritual is called ‘Gau Daan’ and included the bride being presented with a necklace which is the emblem of marital status for a Hindu woman. A sacred fire was also lit (the ‘vivaha-homa’) around which the bride and groom walked around, then offering barley to the fire which symbolises that they will work together for the welfare of the society. To see more of Trishna and Chatan’s wedding photographs, visit Jilllian Hartley Wedding Photography Facebook page. You can also see a slideshow of the best wedding moments here. Are you getting married? Do you like the style of photography you see? Why not contact us for a quote and to discuss your requirements. For more information on Indian wedding planning, check out the Asian Wedding Network website which is a really useful resource. This entry was posted on July 16, 2012 by jkhartley. It was filed under Wedding Photography and was tagged with asian wedding, birmingham, hindu, indian, walsall, wedding photographer, wedding photos.